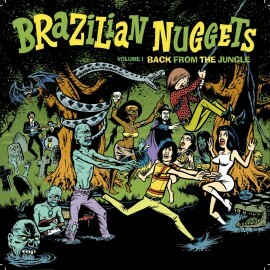 The record- loving audience awaiting a compilation worthy of the name Brazilian Nuggets can start smiling. This material, previously full of dust and forgotten, is now released in a meticulous edition featuring the best of garage rock, aggressive and demented, from Brazilian bands and singers who lived in obscurity during the 1960s and 1970s. For many years, Groovie Records has been researching and collecting the weirdest and most unknown Brazilian rock of that time. A gold- digging activity supported by the priceless help of researchers and collectors like, among others, Fernando Rosa, aka Sr. F.
This compilation is nothing more than a homage to those who fought for rock ‘n´ roll in Brazil during the 60s and mid 70s. The tracks featured in Brazilian Nuggets are mainly from very obscure bands that were not even part of the “Jovem Guarda” movement. What you will do find is the wildest and most aggressive garage, psych and strange rock ‘n’ roll released by unknown Brazilian record labels like California Records, RCS, Fama, Leão Disc, Young, Inspiração, Tema, to name a few. Everyday we realize there is a vast and almost endless catalogue. And among this immense discography, a lot of interesting and unbelievable material exists! A striking moment comes along when we discover a random record like Nicholas Mariano or Os Espiões, amazing stuff that makes Brazilian rock one of the biggest uncut diamonds yet. And what can we say about Lup e Loy, Os Inseparáveis or Os Beggers? A sound made for small audiences during strange dictatorship times in which many people disappeared simply because they were hanging out with friends.